Ports of Los Angeles and Long Beach have forced out many older, dirtier drayage trucks. Latest plan will encourage more use of newer, cleaner equipment. Photos by Tom Berg. There’ll be more natural gas, clean diesel, and electric-powered drayage trucks operating from southern California seaports under a plan proposed by the Ports of Los Angeles and Long Beach. Operation of zero- and near-zero-emissions trucks, locomotives and container-handling equipment would expand beginning in 2019 and culminate with wide use of electric trucks by 2035, according to the next version of San Pedro Bay Ports Clean Air Action Plan, or CAAP 2017. It would also require ships to continue to reduce pollutants while berthed or anchored in the harbors. Under previous CAAPs and a clean-trucks program begun in 2009, the ports have reduced diesel particulates up to 85%, cut oxides of nitrogen (NOx) in half, eliminated 97% of sulfur monoxides, and lowered greenhouse gas emissions an average of 12%, all while container volume has increased by 7%, said a statement from the ports. “The results reflect the ports’ combined clean air progress in collaboration with industry, regulatory, community and environmental partners since 2005,” the statement said. But more progress is needed to further clean the air in the port areas to comply with state and federal decrees and improve citizens' health. Comments can be made through mid February. The final document will go to the ports’ boards of directors for approval in spring of 2017. Then a process of developing rules will begin. Meanwhile, the ports continue to sponsor tests and demonstration projects for advance technologies, like an overhead-wire roadway for electric trucks, she said. The goal is to encourage development of zero-emissions vehicles and equipment that can be economically and effectively deployed at the ports. About $15 million has been invested to date. Liquified natural gas now powers hundreds of port tractors and more are envisioned. Eventually, ultra low-NOx diesels and electric propulsion will appear. 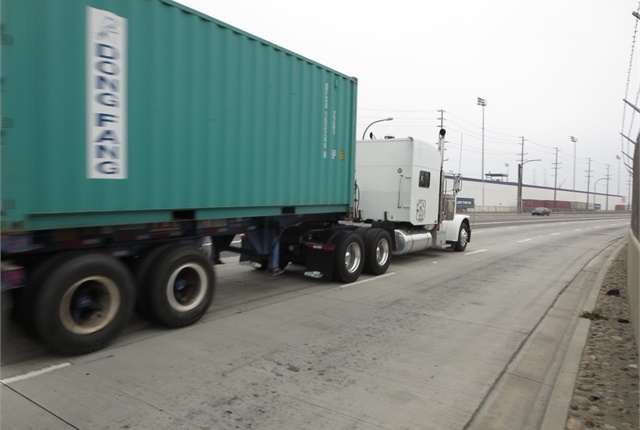 Many natural gas-fueled drayage tractors are now running, and introducing more of them is the quickest way to reduce diesel particulates, NOx, greenhouse gases and other emissions in the near term, according to Lee Peterson, spokesman for the Port of Long Beach. Most now use liquefied natural gas, but compressed natural gas might also be employed. “That’s a market decision,” he said. 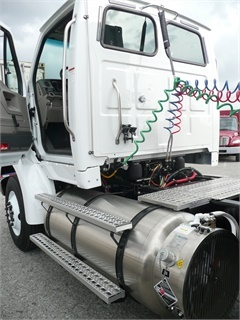 Natural gas engines, primarily the 8.9L Cummins Westport ISL-G, now achieve near-zero levels of NOx, as does the more recent 11.9L ISX12-G, the CAAP statement said. As for diesels, the CAAP wants to eliminate pre-2010-engines which lack urea injection, and encourage use of 2010-spec models through imposition of fees on cargo transported by older, dirtier trucks. The amount of a fee has to be determined, Moilanen said. A previously imposed fee is $35 per 20-foot equivalent unit, a common measure for ocean containers that are 20, 40 and 45 feet long. Fees support the clean air program and fund grants to help operators buy cleaner equipment. Recently introduced 2017-model diesels which cut emissions of carbon dioxide through lower fuel use are not mentioned in the CAAP, she acknowledged. Officials are waiting for the federal Environmental Protection Agency’s development of rules for ultra low-NOx diesels around 2023. With diesel particulate emissions now greatly reduced, NOx is a prime concern because it is a cause of smog in historically smog-prone southern California. The CAAP Discussion Document is available at www.polb.com, www.portoflosangeles.org and www.cleanairactionplan.org. During a review period that ends Feb. 17, the ports will hold additional community meetings to gather public comment on the Discussion Document. Written comments may be submitted to caap@cleanairactionplan.org at any time during the review period. Interested parties are encouraged to register on the CAAP website to receive the latest information and meeting notices.